He grinned, and I shook my head, fishing for a comeback. “I’m going to do something even more amazing the next time your printer isn’t working,” I said, taking his bags from him so he could remove his coat. “What will you do, just think about it?” he said, hanging his coat on the rack. A year later Noam pulled from his briefcase a piece of paper he had printed out on his home printer, and every ninth or tenth line was highlighted in gray. “I’m afraid my printer is no good. I’ll need a replacement,” he sighed, showing me what he considered hard proof of his printer’s proposed demise. “OK, I’ll come by on Monday, and I’ll fix that broken blind on your bedroom window while I’m there,” I said. I arrived at his house on Monday morning with a small tool box filled with dry wall screws and some new brackets fished from my own collection. I removed the broken brackets of the blind he had accidentally torn down the week before, securing the replacement brackets with drywall screws. Screws that are included with curtain rods and most other things to be hung are usually too short, or cheap and easily stripped. Or worse, they have a straight bayonet-type screw head rather than the much-preferred Phillips head. If there were a book of secrets for a happier – or at least less frustrating - life, using Phillips head dry wall screws would be rule number five, or six at the least. I secured the new brackets and slid face plates on so that the blinds wouldn’t fall forward. I found the wand on the floor under the window, and noticed that the silver piece that connects the wand to the turning mechanism was missing, and unless I secured the wand, Noam would have no way to open or close the blinds. I made a mental note to demonstrate for Noam how the blinds work once I repaired the wand, since it was possible that he had no idea that they opened and closed by twisting the wand. Seriously. I walked around the corner from Noam's bedroom to his office, where he was working. “The printer is hopeless,” he said. I ignored his pessimistic response and reached behind him to grab a pen I had spotted with a large paper clip stuck through the pen clip. Probably something he played with during a phone interview. I pulled the paper clip from the pen as I walked back into the bedroom, and opened it enough to poke it through the hole in the wand, connecting that to the mechanism at the top of the blind. I twisted it a few times for extra strength, worked the blinds a few times, and gave the wand a good tug. When it didn’t budge, I got Noam to come back into the bedroom so I could show him how the repaired blind worked. “Wow, another miracle. How did you do it?” he asked, looking up as he turned the wand as I had demonstrated, totally missing the opening/closing feature, as far as I could tell. “Oh, I see, you used a paper clip, just what I would have used!” he said. He smiled and made eye contact, so I went on. I don’t need much encouragement to tell a story. Noam laughed, although I wasn’t sure whether he had been listening to my story, or writing a lecture in his head. It’s possible he had been doing both, since he has made several self-amused confessions about reading a book during a phone interview, listening in for key words and a pause, after which he makes a comment, and goes back to his reading. “Ok, now onto the printer,” I said, causing him to heave another sigh of despair. “See if you can wend your way over to the printer without killing yourself,” he said. Sure, now, with my life at stake, he admits that his home office is a death trap, though he won’t let me move anything until he has a chance to go through the books, until he moves his set-up to another room, until he boxes books up for the library (which he won't let me help with until...), until the summer, until hell freezes over. I truly think his office is an extension of his over-loaded brain, and moving anything would wreak havoc on his thinking process. 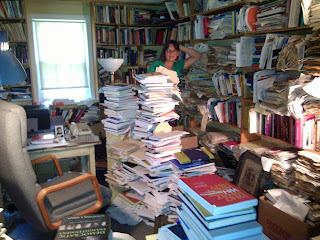 Piles of books balance precariously on a narrow table sitting perpendicular to his desk, and boxes bulging with papers and drafts to be culled and archived are shoved into rows against the wall under shelves overflowing with more papers, books, journals, and awards in an alternating vertical/horizontal checkerboard pattern. There is foot-wide pathway to the printer, and I walk it the way I learned in ballet school as a little girl – one foot in front of the other, wondering as I walked in this tight-rope manner how Noam manages to get to the printer without tripping. My guess is that he trips. I travel from behind his desk to the perimeter of his office to the area in front of his desk, where the printer sits on a tiny table. The printer is plugged in and has power, it is turned on, there is no paper jam, the paper tray is full, and it’s not asking for toner. I turn it off, wait thirty seconds, and turn it on again to clear commands. “Ok, print something out. Print out the document you showed me with the gray lines, if you have it queued up,” I tell him, A few pages print out, and the copy is perfect, with black ink on every line. “This is like asking your baby to say a word when your friends are there to witness it,” I say, and he looks at me blankly. I look to see if he’s wearing his hearing aids, and he is, but I raise my voice anyway, “Ok, print something else, something that’s at least a few pages long.” The document prints without issue, and I laugh. “What, what’s wrong?” he asks, always imagining the worst. “Nothing is wrong. That’s the problem. The printer is working perfectly,” I say, still laughing. “Oh, good, you’ve fixed it!” he says. The idea that one of the smartest people on the planet thinks that I have once again fixed something that was never broken begs not to be argued with, so I nod in agreement. “It’s not as miraculous as the way your nephew fixed your printer, but this is a close second, right?” I ask, and he raises his hand in victory, showering me with thanks as we exchange a firm good-bye hug. At my MIT office an hour later, I open an e-mail from Noam telling me that the blind and the printer are now both working perfectly, thanks to my brilliant repair skills. I shake my slightly swollen head back to normal size and get to work, making another mental note to add a few large paper clips to my tool box. And maybe some fairy dust. 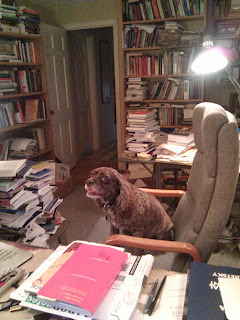 A thoroughly entertaining read, the picture of his home office is illuminating. I'm glad to see there's yet one more thing Noam and I have in common: utter cluelessness when it comes to fixing gadgets. This is so much fun to read. Thanks for sharing some of Professor Chomsky's private life and thoughts here. It's really intoxicatingly great. Great read, a window into Prof. Chomsky's everyday life. Thank you for sharing. Favorite Line: "The idea that one of the smartest people on the planet thinks that I have once again fixed something that was never broken begs not to be argued with, so I nod in agreement." The state of his office is exactly as I had imagined. Thanks for the story! I enjoy writing with a quirky point of view, and have dabbled in stand-up comedy and performance. I spent twenty-four years as Noam Chomsky's gatekeeper, which I swear had nothing to do with my "talent" of fluent backwards talking. Love to our dear departed Roxy, who joined me, Glenn, Morris, and Noam at work for 14 of her 15 3/4 years.